Today I threw together a quick set of new coasters after being inspired by a similar version I came across on Pinterest. 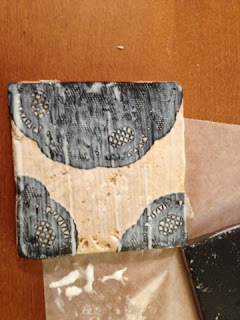 That version used a dye cutter to cut shapes out of scrapbook paper which were then decoupaged onto tiles. The only problem is I don't have a Cricut or a Silhouette...yet. The next best thing - my stash of left over doilies. I had four tumbled marble tiles left over from my DIY photo coasters project so I just used the remainder to make my newest set. 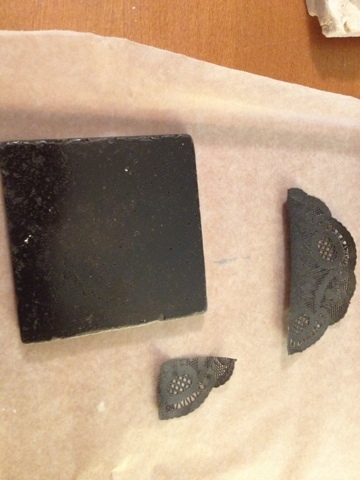 I started off by first spray painting two of the tiles and two of the doilies black. 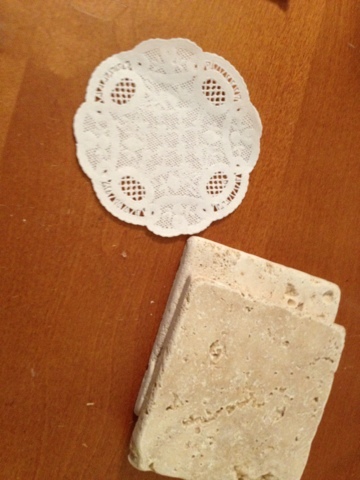 Then I spray painted two more doilies almond color. I originally left them white but they didn't match with the tumbled marble tiles so I just gave them a quick spray to match them a little better. After they were sprayed, I cut them into various sizes. Some I left pretty big and some I cut really small to use in the corners. 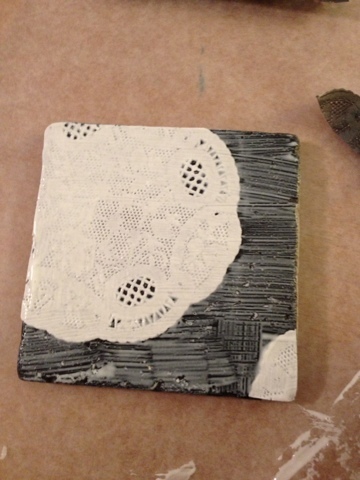 I applied a thin layer of matte mod podge onto the coaster and then a thing layer onto the back of the doily. 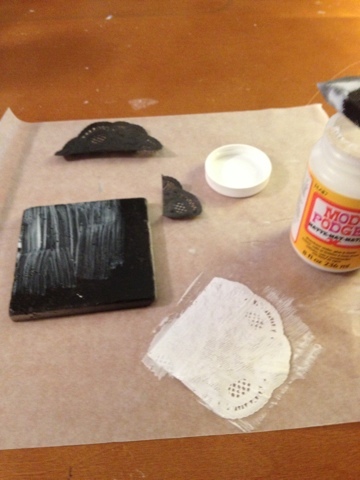 Then I put the two mod podge sides together and pressed down - using the off white doilies on the black coasters and visa versa. Once I had the coaster arranged how I liked, I spread a medium layer of mod podge on top of the entire coaster and let it all dry for a good few hours. Once they were completely dry, I sprayed them with two coats of arcyrlic sealer to water-proof the coaster and added little cork pads on the bottom to protect surfaces. Wouldn't these make an awesome housewarming gift or maybe an end of the year gift for a teacher or maybe just a great addition to my living room?